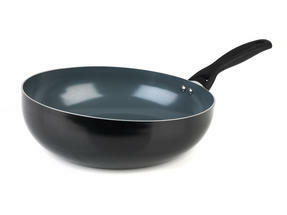 Cook delicious stir fry, fresh vegetables, rice dishes and more using this Progress flip pan. Made from strong aluminium with a high quality ceramic coating on the interior of the pan you can try new recipes with total confidence and the cleverly designed high front edge allows you to flip and toss together your ingredients with ease. Featuring a stay-cool Bakelite handle for maximum safety and comfort, the pan is also completely dishwasher safe for effortless clean up after you have used it. Perfect for making tasty and satisfying meals for your family and friends, just add this Progress flip pan to your kitchenware at home. Measuring 30 cm in length, the pan has a high front edge so you can easily flip and toss your ingredients together without any mess. With a ceramic inner coating so you will not need to add as much oil, you can use the pan on a gas, electric, halogen or induction hob. Made from incredibly durable aluminium, the pan also has a soft-touch bakelite handle for ultimate comfort and safety with every use. Keeping the pan clean is incredibly easy – simply wipe clean with soapy water or place in your dishwasher to maintain its quality.